I've been fairly gushing in my adoration for Salem Wolves pretty much since we started If It's Too Loud... Shake could have been the kiss of death for me with the band. It's definitely more mainstream and almost pop sounding than their previous releases. 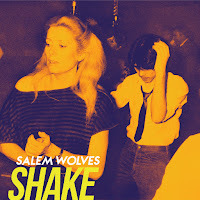 But Shake ended up working for me and is one of my favorite releases of the year. It's big, loud garage rock, but as loud and as harsh as it is, there are amazing songs and harmonies here. Part of the reason is that singer Gray Bouchard is secretly a crooner despite this being a full out rock album. This album has the crossover appeal of a band like The Hives without changing too much around. I'm still shocked no one has used "B.D.F." in a commercial. This has me waiting to hear what's next, which could be even more different since Harrison, the bass player, is leaving the band and is being replaced by Cat Verlicco of The Knock Ups. Songs of note: "Die Like Dogs," "B.D.F.," "Shake." The Prefab Messiahs - "Bring On the Robots"
Housewives - "Speak to Me"
Young Readers - "Silent Night"
Love Love - "It's Christmas We Wanna Be Happy"
prior panic - "backseat driver"
Lillie Mae - "The Christmas Letter"
The B+ Players - "Mandible Claus"
Dani Bell and The Tarantist - "The End"
Baabes - "Won't Be Back"